Undoubtedly, Gray Matters has been committed to provide best services to its clients keeping the customer satisfaction as top priority in every aspect be it in providing coaching for IELTS, PTE and spoken English or providing immigration services for student visa. In order to complete that, we have highly professional and streamlined staff to providing services at a cost effective. As per students wanting to move, study and settle abroad, we wish to extend our greater hand of responsibility to make their dreams come true at earliest. 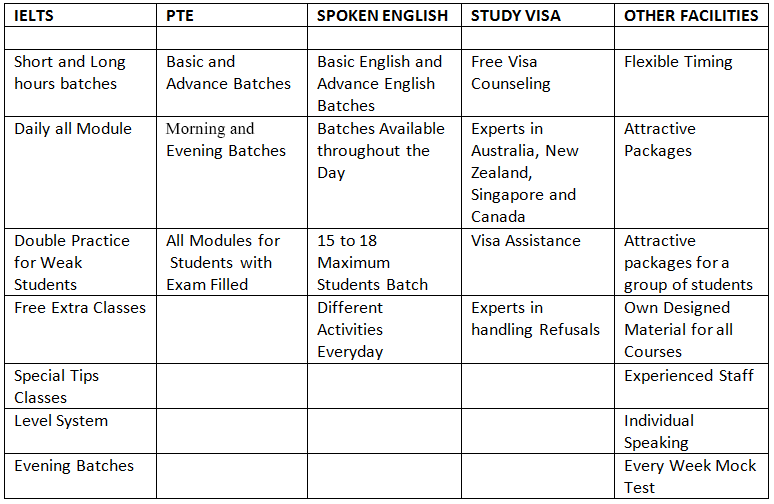 Moreover, in the field of IELTS, PTE and SPOKEN ENGLISH, hopefully, we hire dedicated staff who is ready to give its best. Therefore, now we have countless stories of greater achievements and of our shining stars to share with world. Finally, on evidences, we find ourselves being most trusted to be equipped with exceptional and impeccable solutions. The team of Expert Trainers for IELTS, PTE or SPOKEN ENGLISH has been certified and is strictly asked to follow IDP and BRITISH COUNCIL pattern in all the modules. So that students may not have any problem of finding difference between BAND SCORE here at our centre and there in the examination. The staff, we have hired, is specialized in particular modules for high-level batches and is devoted for the convenience of students everyday for around eight hours. They are expertise by world-leading and internationally excellent research. Our students learn from the best – inspirational academic stuff. Our courses are at the forefront of current knowledge and practice and are revised time to time to update our student body and drop them never alone with an old material and methodology. Even, the material that we have is in plenty, which gives no break for a repetition at all. GRAY MATTERS, provides the students with the most advanced books and study material. We take this time to, specifically, extend our gratitude to everyone such as several books being the resource for IELTS and various websites helping us to complete and compile a refined material of IELTS to practise in classes and to provide students online to practise in their respective fields. Undoubtedly, resource help has been perfectly working out and a great sign of assistance to our functioning, therefore, it is our faith that this will raise us to a position and heights, which will not match on international platform.